Antarctica's Ice Sheets Are Melting Faster — And From Beneath : The Two-Way Researchers say the ice is melting more quickly than they've ever seen. They think it's because warm water is circulating under the ice shelf, and that the melting process appears to be irreversible. 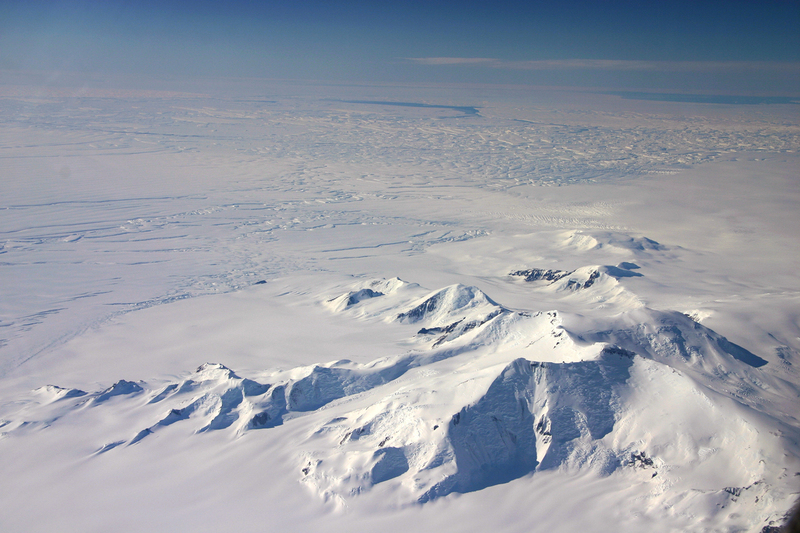 This image taken in 2012 shows part of the Crosson Ice Shelf (center left) and Mount Murphy (foreground) on the western edge of Antarctica. Thwaites Ice Shelf lies beyond the highly fractured expanse of ice (center). Antarctica's ice has been melting, most likely because of a warming climate. Now, newly published research shows the rate of melting appears to be accelerating. Antarctica is bigger than the U.S. and Mexico combined, and it's covered in deep ice — more than a mile deep in some places. Most of the ice sits on bedrock, but it slowly flows off the continent's edges. Along the western edge, giant glaciers creep down toward the sea. Where they meet the ocean, they form ice shelves. The shelves are the specialty of Ala Khazendar, a geophysicist and polar expert at NASA's Jet Propulsion Laboratory in Pasadena, Calif.
"You have this floating plate of ice being fed by the glaciers flowing from the interior of the continent," he says, "while having ocean water underneath it." He calls the shelves "the gates of Antarctica." Although the shelves float, they're still connected to the mainland. The point at which the ice shelf is no longer supported by bedrock is called the "grounding line." A team from JPL has been studying that grounding line in several places along the edge of the West Antarctic ice sheet. They used radar to look beneath the ice. In particular, overflights have targeted ice shelves along the West Antarctic ice sheet known as the Amundsen Sea Embayment. Khazendar says the more the bottom of the shelves melt, the more ice is exposed to warm water. "It becomes a runaway process," he explains, "which makes it unstable." Where's the warmer water coming from? The team, whose findings appear in the journal Nature Communications, points to global warming that's heating up the oceans. There's been a spate of research lately showing that Antarctic ice is melting faster than previously thought — and raising global sea levels. Khazendar says the melting process appears to be irreversible. Polar scientists fear that at some point, the shelves will collapse and Antarctica's glaciers will flow into the sea. As to whether and when that might happen? "The simple answer is we don't know. And that's the scary part," Khazendar says.